The human body is under constant threat of foreign invaders (bacteria, viruses, parasites) that can cause infectious diseases. The reason why this often does not occur is the immune system, a complex collection of molecules and cells which detect and eliminate foreign invaders. Crucial for this vital role in the maintenance of our well-being is that the own body is spared. This implies that the immune system is able to distinguish cells and molecules (called antigens) belonging to the infected host (called self-antigens) from nonself-antigens expressed by the invaders. The immune system acquires this capacity during fetal development by the specificity selection of T lymphocytes (a type of white blood cells), which orchestrate the immune reaction. This selection takes place in the thymus, a glandular organ located just above the heart, where T cells reactive with self-antigens are eliminated by negative selection, while T cells reactive with nonself-antigens are enforced by positive selection. Fig. 1. Clinical consequence of myelin damage. In healthy people (left) nerves are enwrapped in myelin sheaths, which secures fast saltatory conduction of electrical signals from a motoric nerve cell to a muscle, causing contraction. In MS one or more myelin sheaths are damaged and efficient signal conduction is disturbed. The existence of autoimmune diseases, a group of clinical conditions caused by T cells attacking organs or cells of the own body, demonstrates that negative selection of anti-self T cells sometimes fails. One explanation for why certain self-specific T cell specificities escape thymic selection is that the presentation of self-antigens by antigen presenting cells in the thymus fails. This occurs when the self-antigens are destroyed before they can be loaded onto the MHC molecules that present antigen to T lymphocytes. This has been shown for the self-antigen myelin basic protein (MBP) present in the nerve-enwrapping myelin sheaths in the brain and spinal cord. MBP is a putative target of immune attack in patients suffering from the neurological disease multiple sclerosis (MS). As the destruction of myelin sheaths hinders the efficient conduction of electrical pulses through the nerves, MS patients experience loss of sensory and motoric functions (Fig. 1). Fig. 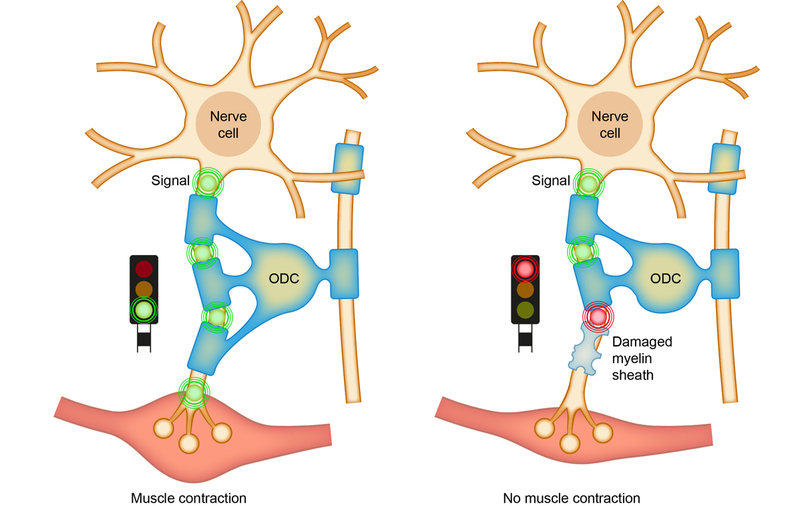 2. mechanisms of demyelination: depicted (1) are a healthy oligodendrocyte (ODC), which produces multiple (up to 50) myelin sheaths for enwrapping of axons. Myelin damage can occur (2) via immune injury to myelin sheaths (by antibody + macrophage (Mf)), but sparing the oligodendrocyte or (3) by the kill of oligodendrocytes by cytotoxic T lymphocytes (CTL). Research in a relevant preclinical monkey model of MS (called experimental autoimmune encephalomyelitis; EAE), has identified an uncommon type of T cells with a crucial role in the progressive worsening of neurological functions. 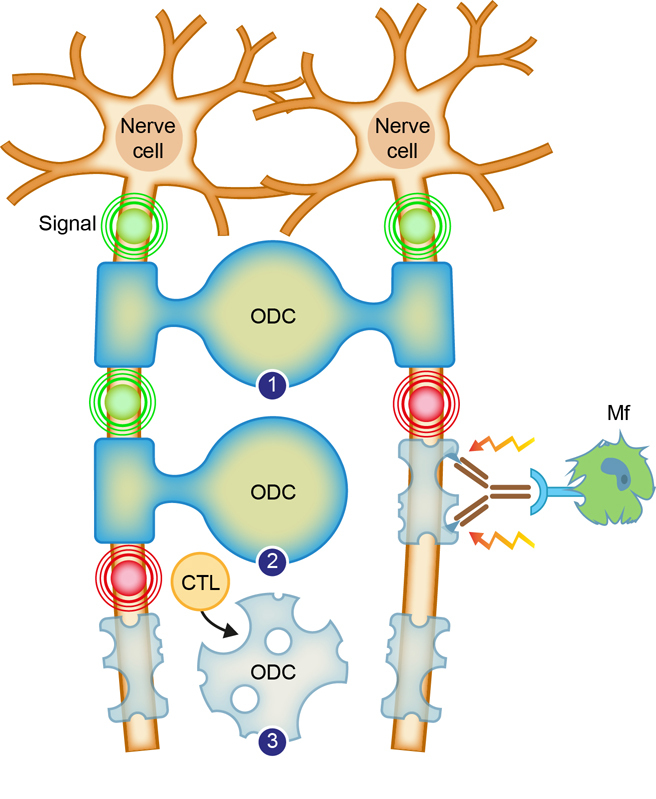 These T cells can directly attack the cells that produce the nerve-enwrapping myelin sheaths (oligodendrocytes; Fig. 2). In the monkeys the T cells can be artificially activated by the injection of a fragment (residues 34-56) from another myelin protein, myelin oligodendrocyte glycoprotein (MOG). It is unclear how these T cells are activated in the MS patient. One possibility emerging from the monkey EAE model is that activation occurs when myelin is injured via another pathological process, a genetic defect or an infection for example. MOG released from injured myelin is captured by immune cells located in the cervical lymph nodes that filter fluids coming from the brain. To test this, we injected MOG protein into monkeys and determined the activation of T cells specific for different fragments (epitopes) of the molecule. Surprisingly, we found that T cells specific for epitopes less relevant to the disease are activated, while activation of the pathologically most important T cells specific for MOG34-56 was undetectable, although the T cells are present. Studies in the monkey EAE model indicate that EBV-infected B cells are responsible for the activation of the MOG34-56 specific T cells. We found that while feeding of the MOG34-56 peptide to primary B cells leads to its degradation by the protease cathepsin G, EBV infection induces a variety of changes in the B cells, which lead to the protection of the MOG34-56 antigen against destruction so that it can be presented to T cells. We postulated that this mechanism may underlie the strong association between EBV infection and increased MS risk in the human population. Lymphocryptovirus Infection of Nonhuman Primate B Cells Converts Destructive into Productive Processing of the Pathogenic CD8 T Cell Epitope in Myelin Oligodendrocyte Glycoprotein.